Avengers Infinity War didn’t get me back behind the keyboard, nor did the significantly better Deadpool 2, but this week's comics did. 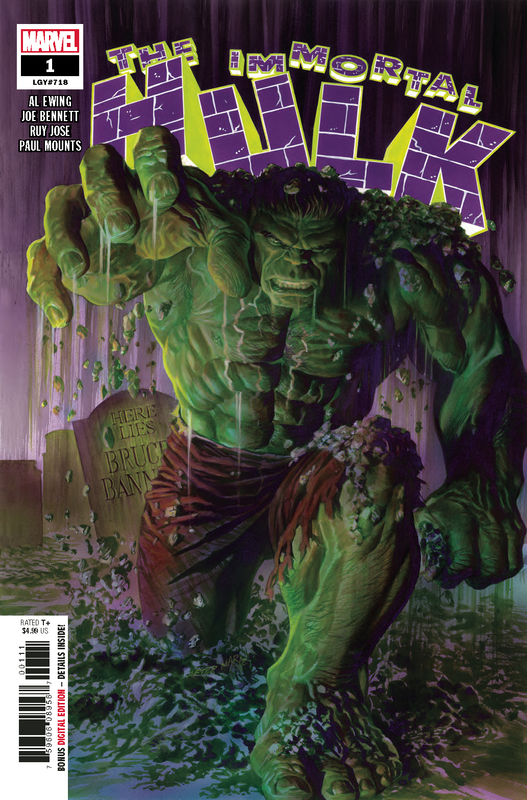 In particular relaunched icons, Justice League from DC, and the subject of this post, Marvel's The Immortal Hulk #1. Due to the mess the majority of the publisher's titles seem to be in, I almost didn’t pick this up. However, the Hulk has always been one of their ‘Big 3’ icons to me. With Bruce Banner reborn and ‘Hulk-superhero’ replaced with the spine-tingly good ‘horror-star-Hulk’, the Jade Giant is not the only one back from the dead. This issue is the first real sign that the former House of Ideas is no longer letting the tail that is the Marvel movieverse, wag the dog that created it. Writer, Bruce Jones' HIGHLY-unsung Hulk run featured a dark and moody tale of Banner hunted for the destruction wrought by his uncontrollable alter-ego. In a similar shade, new scribe, Al Ewing has Bruce off-the-grid and alone, brilliantly questioning his place on the good to bad spectrum, and well aware of the devil inside. And what a devil it is. This Hulk is not only intelligent and sinisterly vengeful against those who cross him, this Hulk won't die - and by extension, now, neither can Bruce. There is no longer any escape from his own personal demon. A demon who sees the man or monster inside you AND has the muscle to do something about it. Replacing the 'Manhattan-based super-villain beatdown' setups of other comics with heartland America and human natures as twisted as Bruce’s own psyche, this issue feels like a modern Dr Jekyll and Mr Hyde take on the Lou Ferrigno / Bill Bixby nomadic TV adventures that helped make the Hulk such a pop-culture smash. Case in point, the issue's 'villain' is merely a man whose efforts to repay a gang loan and keep his family safe, backfire in the worst way possible. While Joe Bennett’s art balances the dark with the light, the standout for me is how colourist Paul Mounts makes Hulk’s eyes horrifyingly glow like neon in the night. “There are two people in every mirror. There’s the one you can see. And there’s the other one. The one you don’t want to." After reading this issue, you too will see the Hulk in every reflection. Welcome to the world of Bruce Banner, and get ready for what really goes thump in the night.